There is a TV show that accurately depicts the world we are moving towards. America is being occupied and the occupier is almost invisible because there is presence is everywhere and anywhere at the same time. Amazon Prime has produced an outstanding original TV series, called The Man In the High Castle. The TV show alters history and the winners of World War II are the Nazis and the Japanese. In the show, America is carved up among the winners and the occupation of the United States is brutal and complete. In the show, every facet of 1962 American life is controlled by the occupation. All school curriculum is based on the Hitler Youth Movement. History is rewritten. Jazz music is banned because the Nazis associate the music as belonging to Blacks and Blacks, since the time of the Munich Olympics are viewed with disdain because Jesse Owens destroyed the master race myth. All movies, TV shows and available books are controlled for content by the ruling authority. In the show, the Japanese rule the western states and the Germans rule the rest of the country. There is no real system of justice. When a suspected infraction is suspected, the secret police are dispatched and these agents become the judge, jury and executioner and the “guilty” are executed on the spot. The best a person under suspicion can hope for is to be jailed and tortured. Then, forced confessions are followed by execution. The stakes are also high for the occupying forces as the Japanese occupation leadership is forced to commit suicide if they lose face because of an action of resistance by dissident Americans. In these cases, the Germans murder their own. In this show, people meet in churhes for things like funerals and weddings, but it is the state that is supreme. However, the “minister” leads chants of loyalty towards the state, not not the supreme being of the universe. There is no God to be worshipped. Religiou practice is punishable by death. Speaking of death, in the TV show, when a parent has a child with a physical defect (e.g. asthma, diabetes, MS, etc.) both the parent and the attending physician have an obligation, within the spirit of extreme Fabian Socialism, to report such a child and the ruling authority shows up at the parents house complete with soldiers armed with machine gunsand takes the child away to be terminated “for the good of the state”. The TV show demonstrates what life is like for people who are completely occupied. Today, our occupiers have an identity and it is Google. This is the planet being created by Google. The aboslute power being garnered by Google will soon result in a world controlled by Google. Google dominates AI and in a few short years, they will completely control the industry. Putin has spoken of the dangers of a world controlled by AI. Although I did not realize it at the time, Putin has stared down Google and sees the threat. Could Putin have been talking about anyone else, but Google? Putin should nice to Google and so should Donald Trump. With Google’s growing ability to dominate the Internet, any nation who is not compliant with Google’s advertiser-friendly principles, will find their command and control, which is Internet based, shut down. Google has the ability to stop an army in its tracks. Any Internet application, from a military perspective, is subject to manipulation and control by Google. On my last show, Mike Adams said that Google is more powerful than nations and he is unquestionabily correct. If Google can determine winners and losers in an upcoming war, what about elections? George Soros is only an intermediary in election fraud with his voting machines that stole the Democratic Primary from Bernie Sanders. In the immediate future, Google will control all voting machines in the tradition of Stalin who said “I don’t care who votes, I only care about who counts the votes”. And today, Stalin’s representative at the polls is Google. As an aside, some will ask me why I compare Google to the Nazi empire? The answer is simple and is supported by historical events. The strongest measure of control over a society was in Nazi Germany. 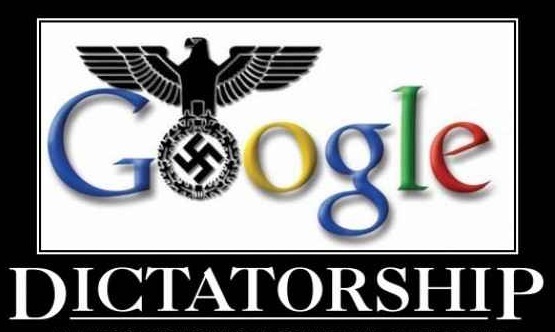 Google is on the path to exercising complete control and as the saying goes, ..”absolute power corrupts absolutely…” and the Google’s control will undoubtedly default to Nazi principles. Google and the Nazi Empire are a hand-in-glove-marriage. Google c0-founder, Larry Page, previously stated, off-handedly, that “Google is not about building a search engine, we’re really making an AI”. This makes the aformentioned warning from President Putin that much more relevant in terms of the threat to humanity posed by Google. Google, right now, is all about building the world’s comand and control that will take care of every person, track every conversation, both personal and elecctronic, know every thought, desire and attitude and will control the dispensing of all resources, all the time and in each and every instance. Both direct and indirect Internet searches are dominated by Google, as they control nearly 80% of the Internet searches. Their power is real and it is in effect as I write these words. …”the digital world suffers from what’s called “The One Winner Effect”. Basically it means that there’s only place for one great winner in every sector. So there’s only one Facebook – the second largest social media network in English is Twitter, with only ~319 million users. That’s nothing compared to Facebook’s 1.86 billion users. And then, there is Google where their measure of control is beyond anyone’s ability to estimate the sheer volume of control that Google enjoys. Google controls the home appliance industry with their incursions into the next generation of voice-activated controlled washers, dryers, freezers, irons, toasters , etc. Google is in the process of “learning” to control every appliance and Google has shown the mentality that if you do not comply with the correct and approved attitudes, sanctioned by Google, you risk being shut out of using appliances who would have learned your habits and the appliances would behave accordingly. You go out to the street and order an autonomous taxi to take you to your workplace. Who programmed that autonomous car? Google did. Who acquired Waze – a crowdsourcing navigation app? That’s right: Google did. By the way, Futurism and others have predicted that Google, at the present rate of growth, will control the planet and its industries by 2030. COULD THIS BE WHY THE UNITED NATION’S AGENDA 21 CHANGED IT’S NAME TO AGENDA 2030? If you and your business interests want to survive longer than a decade, you better learn to say the words, I LOVE GOOGLE! SEIG HEIL! I LOVE GOOGLE! Seriously America, you better learn to say “Heil Google” as you extend your right arm into the air as you click the heels of your Google manufactured boots. As America is in the process of being occupied, do most Americans even know who our occupier is? Is it the Russians? Is it the Chinese or a combination of the two. Is a Red Dawn scenario unfolding as I write these words? No, it is none of the above. The identity of the occupying force is Google. And and like any occupation for in history, there are 17 things that history shows one can count on. 1-Mass roundup of political dissidents. These will most likely be declared as terrorists and enemies of the state and will be linked to the precipitating false flag event. 2-Dusk to dawn curfews which are designed to keep the people from congregating and planning in concert to overthrow the omnipresent tyranny. 3-CONTROL OF ALL FORMS OF KNOWLEDGE AND ENTERTAINMENT. 4-The seizing of personal assets such as food and water. 6-The prohibition of weapons of any kind including guns, knives or chemicals which can be turned into explosives. It will become a capital crime to possess a weapon of any type. 8-Arrests without due process (NDAA). 9-Massive “papers please” checkpoints with intrusive searches. Please note that Disney visitors now have to submit to TSA groping. 10-Forced relocation of suspected American dissidents as specified by the Civilian Inmate Labor Program and the Civilian Conscription Program. 12-Outlawing of free speech. Following recent terror attacks. 13-The installation of massive surveillance programs and the establishment of snitch programs which would mark the rebirth of former Secretary of DHS, Janet Napolitano, in which neighbors are encouraged to “say something, if these see something”. The NSA police state surveillance programs speak for themselves. It is highly recommended that every American see the Oliver Stone movie, Snowden. 14-The total control or elimination of religion. The Bible is already being characterized as hate speech. Today, one who is Christian is cast as anti-gay/transgender, anti-government, etc. 15-Control of the media. Except for the total eradication of the alternative media, this has already happened. ICANN will finish the job. ICANN has already given control of the Internet on an every-increasing basis. 16-Executions without due process of law (NDAA). 17-Total suspension of the Constitution or any semblance of the rule of law. I actually predict that you may find this story in a Google search engine as Google will mock any resistance to their growing empire. Heil Google!